Our San Carlos facility provides camp opportunities throughout the year for children between the ages of 4 and 12 years old. “Circus on Stage” activities include gymnastics, acrobatics, tumbling, circus acts, and choreography. No prior gymnastics experience is required! The gym is open at 8:00 am for drop off with no additional charge. Campers are split into groups by age and must be 5.5 years old to attend full day camp. Every Friday at 12:30 pm, parents are invited to enjoy our colorful weekly performance where our young actors will perform the acts and skills that they learned in camp. Please note: a $60 (per week) non-refundable deposit is included, and required to reserve a camp slot. 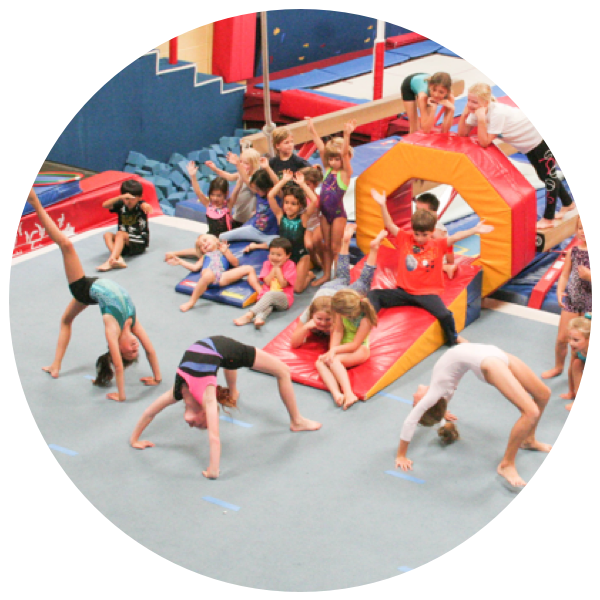 All individuals/minors that will participate in activities at Peninsula Gymnastics should have a waiver form filled out by a parent or guardian. In consideration of using and participating in the Peninsula Gymnastic's premises, equipments, services, and activities (collectively “Activities”) I represent that I understand the nature of these Activities and that I am qualified, in good health, and in proper physical condition to participate in such Activities. I acknowledge that if I believe event conditions are unsafe, I will immediately discontinue participation in the Activities. I fully understand that these Activities involves risks of serious bodily injury, including permanent disability, paralysis and death, which may be caused by my own actions, or inactions, those of others participating in the event, the conditions in which the event takes place, or the negligence of the “releasees” named below; and that there may be other risks either not known to me or not readily foreseeable at this time; and I fully accept and assume all such risks and all responsibility for losses, cost, and damages I incur as a result of my participation in the Activities. I hereby release, discharge, and covenant not to sue Peninsula Gymnastic, its respective administrators, directors, agents, officers, volunteers, and employees, other participants, any sponsors, advertisers, and, if applicable, owners and lessors of premises on which the Activities takes place, (each considered one of the “RELEASEES” herein) from all liability, claims, demands, losses, or damages, on my account caused or alleged to be caused in whole or in part by the negligence of the “releasees” or otherwise, including negligent rescue operations and future agree that if, despite this release, waiver of liability, and assumption of risk I, or anyone on my behalf, makes a claim against any of the Releasees, I will indemnify, save, and hold harmless each of the Releasees from any loss, liability, damage, or cost, which any may incur as the result of such claim. AND I, the minor’s parent and/or legal guardian, understand the nature of the above referenced activities and the Minor’s experience and capabilities and believe the minor to be qualified to participate in such activity. I hereby Release, discharge, covenant not to sue and AGREE TO INDEMNIFY AND SAVE AND HOLD HARMLESS each of the Releasees from all liability, claims, demands, losses or damages on the minor’s account caused or alleged to have been caused in whole or in part by the negligence of the Releasees or otherwise, including negligent rescue operations, and further agree that if, despite this release, I, the minor, or anyone on the minor’s behalf makes a claim against any of the above Releasees, I WILL INDEMNIFY, SAVE AND HOLD HARMLESS each of the Releases from any litigation expenses, attorney fees, loss liability, damage, or cost any Releasee may incur as the result of any such claim. I agree to Terms and Conditions of Participation. If you haven’t filled out a Waiver form for the child(ren), please do so here. Waiver form is required to participate in any activities at our facility. My child is currently enrolled at Peninsula Gymnastics. *** Please note: Student must be enrolled at the time of the registered camp week to receive promotional price. Congratulations Early Bird. You Get the Worm!